BetOnline is one of the few major bookmakers that accept gamblers from the United States. While some other US friendly bookmakers cover horse racing on their websites, only BetOnline allows you to wager on horse racing via your phone. With BetOnline Mobile you can bet on horse racing from every racetrack in the USA from any iPhone, Windows Phone or Android device. Users of the BetOnline racebook app can avail of their 7% daily racing rebate and generous new player bonuses. BetOnline give every new racebook user a risk-free $25 bet to place on any horse race. Smartphone users also get $50 free-play the first time they wager from any iOS or Android handset. BetOnline offer a browser-based web application so it can be installed on any device instantly. BetOnline is a high-quality internet sportsbook that attracts lots of professional gamblers because of their competitive odds, fast payouts and high betting limits. IMPORTANT: In order to see the horse racing section, you have to go to the BetOnline web-app and log in first. Then click on the Horses menu from the top navigation bar and you will see the available horse racing markets. Fans of U.S. horse racing can watch live horse racing from dozens of racetracks in the U.S. thank to the Horse Races Now app. 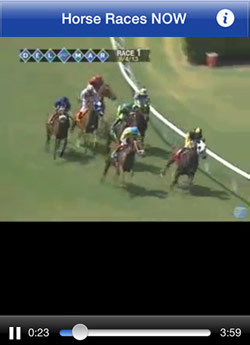 Horse Races Now broadcasts live streams and on-demand videos of horse races going back two years. Unlike in the UK, Ireland and Australia where you are expected to pay to watch a race live, with Horse Races Now you can watch every race from over 50 US racetracks for free. 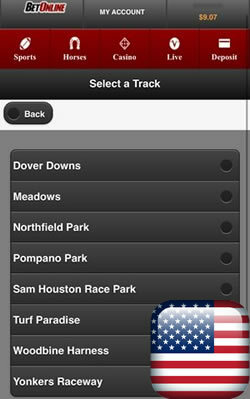 The app also provides overnight entries for upcoming races and publishes results and payoffs immediately after each race. You can follow your favourite horse, track, trainer, or jockey by setting up push notifications that will alert you every time there is a new race or even a workout. It's also super easy to search for a particular race replay because you can filter by race, trainer, horse name or jockey. 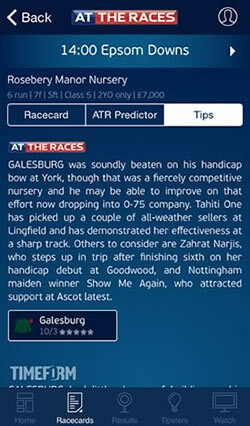 The app also comes with a complete form guide for every upcoming race from US racecourses. Horse Races Now is free to download and use. 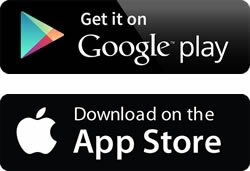 iPhone and iPad owners can download the app from the App Store on iTunes, while Android users can get the app from Google Play. The Racing Post is probably the best known and most respected resource for horse racing information in the United Kingdom and Ireland. The world's most downloaded horse racing app provides detailed racecards, breaking news, results, betting tips and live audio. Probably the most popular section of the app is the "Tipster" area. Inside the racecard for each race the Racing Post have helpfully listed the betting tips for every major newspaper and horse racing publication. A computer generated prediction is also provided based on complex mathematical algorithms. In addition to that, the Racing Post app is directly connected to some of the best bookies in the industry such as William Hill and Ladbrokes. You can place your wagers and take advantage of various promotions and free bets without leaving the app. Basically, you have everything you need in one place. The iOS and Android versions of the Racing Post app come with Bet-And-View service that allows you to watch live horse racing from around the globe. The Racing Post application is available on both iOS and Android from Google Play and the iTunes App Store. The best resource for information on thoroughbred horse racing in the United States has to be the "Equibase Racing Yearbook" (formerly known as Americas Best Racing). The Equibase Racing Yearbook app provides videos, results and statistics going back to 2010, so there is a huge amount of historical data available. There is a breaking news section and full analysis of every upcoming race. 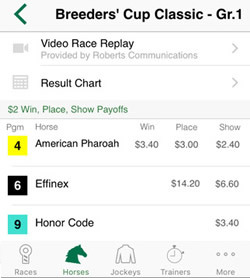 With the Equibase Racing Yearbook app you can quickly check the top 3 finishers in each completed race and get the payoff information. Results charts provide a complete recap and overview of each race. The Equibase Racing Yearbook application can be found both in the iOS App Store and in Google Play and is an indispensable resource for anyone with an interest in American thoroughbred horse racing. Paddy Power is one of the leading iPhone and Android sports betting sites when it comes to horse racing. This is also true for their mobile application which offers unbeatable horse racing coverage. There is a wide variety of odds and betting markets for UK, Irish and Australian horse racing. With Paddy Power Mobile can watch live horse racing on your phone from every major racecourse in Ireland and the UK. To access a live stream you just have to bet at least 1 EUR or GBP on any race. Alternatively, if you don't to place a bet you can listen to a free audio commentary of each race on your Android or iPhone. Since many racing punters are interested in betting tips, the Racing Post provide analysis and predictions on every race. 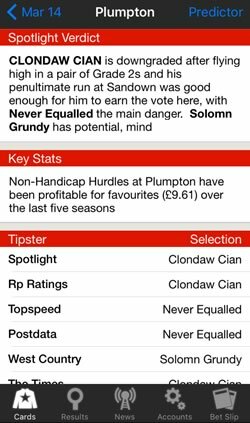 This tipping section offers stats, results, expert opinion and independent analysis for most races. With Paddy Power Mobile you can even cash-out your bet early from your iPhone or Android. Installing the Paddy Power app is easy. You can visit the website to access their browser-based app if you use Windows Phone or Android. iPhone and iPad users in a limited number of countries can download a native app from the App Store on iTunes. 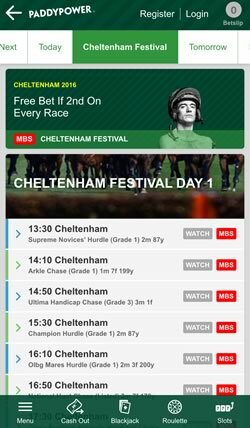 At The Races is a major horse racing broadcaster who have also develop an excellent app. It primarily covers UK and Irish racing events and provides tons of useful information for bettors. Their mobile application is well-designed and is available to download on iOS/Android. Windows Phone and BlackBerry users are invited to use the web-app. At The Races mobile is crammed full of useful racing data. There are statistics, results, tips, analysis, and a huge video archive with more than 13,000 races that you can watch for free on your tablet or smartphone. With "At The Races" mobile you can find everything you need in one app. If you need additional info on a specific horse, just tap on it. This will show you age, weight, form, and other important details. If you are using an iOS device and have ATR subscription, you will be also eligible for live videos. Another bonus is the collaboration with Ladbrokes, and William Hill. You can see the best odds real time and even take advantage of free bets and promotions. The Android app is a bit limited, but still contains all the main features. It can be installed from the Google Play Store and the Apple one can be found in the iOS App Store. Horse racing is one of the oldest sports in the world and has gambling traditions that start way back. It is popular in many countries and millions of people attend the various racing festivals each year. There are a wide variety of horse races such as trots, thoroughbred, harness, jump (national hunt) and many countries have their own specific rules. The differences lie in the distance, the length of the race, the soil, and many other factors. Great Britain holds some of the oldest horse racing events in the world. This is the second most attended sport in the country. It is no surprise that it is home of some of the most famous tracks in the world like Newmarket, Ascot, Cheltenham, York, Sandown Park, and many other. Legendary competitions include the Cheltenham Festival, the Grand National, the Ascot Festival. Another country with great traditions is the USA. Horse racing goes back to the 17th century there and today it is still very popular all around the country. The most important festivals include the Kentucky Derby, the Preakness Stakes, the Belmond Stakes, the Breeders Cup, and others. There are also other countries where horse racing is popular such as France, Canada, China, Australia, and many more. This is the reason why betting on online races generates billions of dollars in turnover each year. Gambling operators are acting accordingly and the market is well developed. In the past few years, this has also reached mobile devices with a number of useful apps available to horse betting enthusiasts.